The Pacific Crest Trail, May 14, 2004. Taken near the southern entrance to the Mount Jefferson Wilderness Area from Highway 20 Santiam Pass, in Jefferson County, Oregon. In addition to being unsightly and dangerous due to the threat of falling limbs, trees and reburning, much of this trail segment has been closed or difficult to traverse since the 2003 B&B Fire Complex because of accumulating debris. (Photo by B. Zybach, Oregon Websites & Watersheds Project, Inc.). Recreation and aesthetics. 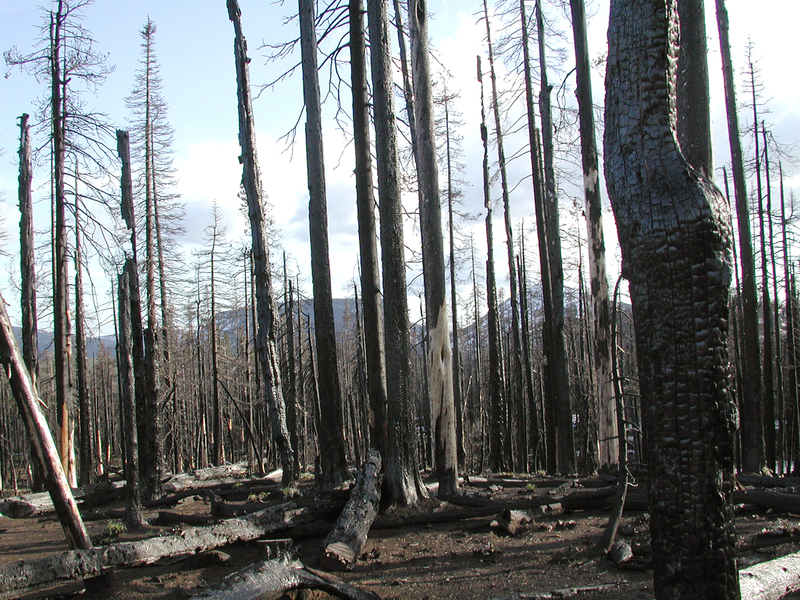 Campground closures, evacuations, business-related shutdowns, and structural assets damages and destruction are direct recreation losses related to wildfire events. Indirect losses include pre-fire recreation-related investments on the part of public providers and private users. 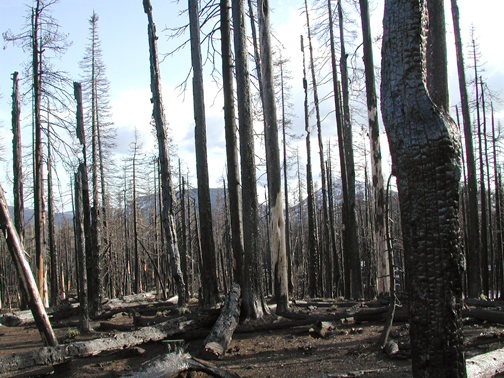 Post-fire losses include recreational activity decline, quality of scenic values, compromised experiences, structural repair, and reduced business income, jobs, and tax revenues. Englin, Jeffrey, John Loomis, and Armando Gonzalez-Caban 2001. "The dynamic path of recreational values following a forest fire: a comparative analysis of states in the Intermountain West," Canadian Journal of Forest Research. Vol. 31: 1837-1844. Kline, Jeffrey D., Ralph J. Alig, and Brian Garber-Yonts 2004. "Forestland Social Values and Open Space Preservation," Journal of Forestry. December: 39-45. Loomis, John 2005. Updated Outdoor Recreation Use Values on National Forests and Other Public Lands. USDA Forest Service, Pacific Northwest Research Station, General Technical Report PNW-GTR-658: 26 pp. White, Eric M. and Daniel J. Stynes 2008. "National Forest Visitor Spending Averages and the Influence of Trip-Type and Recreation Activity," Journal of Forestry. January/February: 17-24.